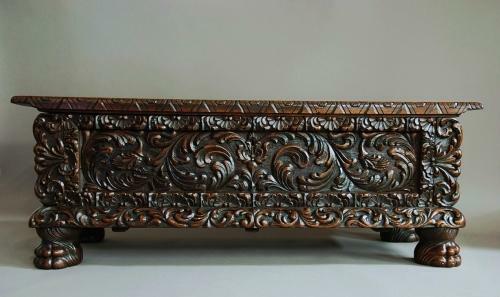 This piece consists of a solid oak top with carved and moulded decoration to the edge. The decorative front is profusely carved with foliage and shell designs with a central recessed panel of carved acanthus. The acanthus design is replicated on the lower moulding beneath. The chest has panelled ends and stands on four, bold animal paw feet.